Yesterday, I finally delivered my service offered in the PCV charity auction to benefit Billy, a fellow volunteer, whose home was destroyed by a fire in October. Well I mostly delivered it. For the auction, I offered to run to Billy's site (~30k away) and "deliver a hug" from the high bidder, as well as buy Billy lunch. To my amazement, my item ended up raising the most for the benefit thanks to a very generous volunteer who bid 50,000 colones (~$100) for me to run over 35 miles round trip and give Billy a super sweaty hug. Unfortunately, Billy wasn't in his community yesterday, so I couldn't give him that hug (I'm sure he's okay with that), but I did make the trek out to Aldea. Friday night, I laid all my gear out then went to bed even earlier than normal. I was up before 5:00am, ate a little homemade bread, and was on my way a little after 5:00. 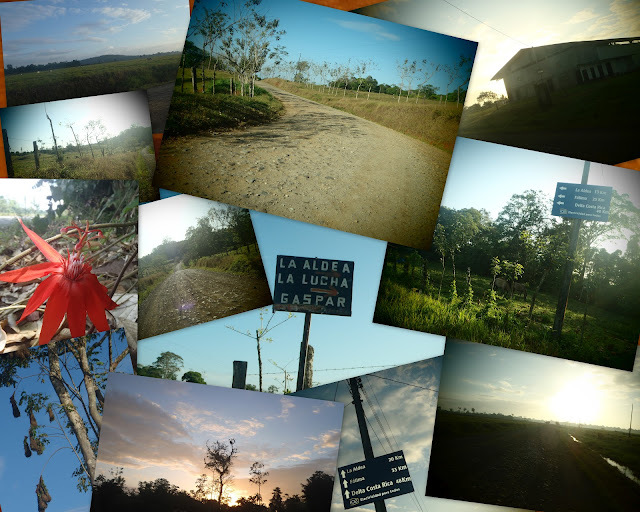 The run to Aldea was beautiful. The dirt road wound through cattle ranches, banana and pineapple plantations, and stands of trees full of tropical birds and howler monkeys. I cruised into Aldea a little after 8:30. I found a bench in the shade and started getting things squared away for the back of my out and back. While I was refilling my handhelds with agua dulce, a gentleman for the community approached and we started chatting. He either remembered me from when I rode my bike to Aldea a year and a half earlier, or he figured any gringo that came to Aldea on foot had to be a friend of Billy. The conversation quickly turned to the new EBAIS (clinic) that the community is building and he asked if I could donate to construction. I told him I could not, we shook hands, and I gathered my stuff and started back to La Colonia. Despite being before 9:00am, it was excruciatingly hot already. I was starting to worry that the over three liters of water I brought for the journey wasn't going to be enough. I kept moving forward, nursing the agua dulce in my bottles and the fresh water in the bladder in my backpack. About 10k out of Aldea, I was feeling pretty horrible. I was sure that I had picked the hottest day in Sarapiquí's history to run to Billy's site. I started using the utility poles as markers and alternated running and walking between them. In addition to the heat and dust, my stomach wasn't feeling quite right. I knew that if I threw up, I'd be in really bad shape since I wouldn't have any way to replenish the fluids and fuel I'd lose. Thankfully I didn't throw up, but with about 11k left, my initial fear of running out of fluids was realized. Luckily I knew there was small community with a corner store only about a kilometer ahead. When I got home, a little before 2:00, I drank a bunch of iced tea and ate some leftover taco pizza before taking a wonderfully cold shower. Out of the shower, I ate and drank some more, and then tended to my sunburned thighs and chaffed hips. During my struggle back from Aldea, I was getting pretty worried about my upcoming 50 miler, but today I feel great, I even went for an hour and fifteen minute bike ride this morning. It seems that most of my distress during yesterday's adventure was due to the crazy heat and not enough fluids and fuel, not physical shortcomings, and, once again, I was able to mentally battle through. Chris!!! I hate that I missed you, but I hope a dry hug will do. You inspire me. That run isn't easy on a bus my friend, but you are amazing for finishing it. I can't wait to chat about it in person in the coming weeks, and I do have more tea as hopefully a reward for your efforts!!! That 'h' in H2Oh will get you. I also once bought it thinking it was flavored water...so, don't feel too ashamed.